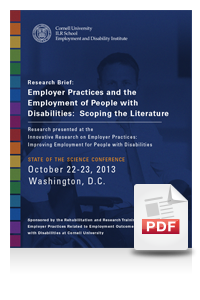 Literature related to research on employer best practices supporting the hiring, retention, and promotion of people with disabilities. These articles study the demand (employer) side of the employment equation, focusing on the ways in which employer policies and practices affect the employment outcomes of individuals with disabilities. 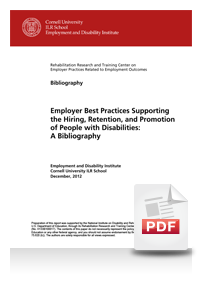 Bibliography of literature related to research on employer best practices supporting the hiring, retention, and promotion of people with disabilities. These articles study the demand (employer) side of the employment equation, focusing on the ways in which employer policies and practices affect the employment outcomes of individuals with disabilities.